Happy fall weekend everyone. One thing I always like about this time of year is starting to cook "comfort food" that we don't take the time to fix in warmer weather.We finished a big pot of soup and just had a great meal of pork chops baked on top of celery stuffing with an apple on each chop. Yesterday was the first basketball game of the season (exhibition game), but we did get a first look at the team for the year. We've had season tickets for this women's college team since the mid 1990s. Genealogy wise I am about burned out on digging into land records. I did profiles for 6 of the 90 individuals in a probate notice and discovered that my gg grandmother and her brother remain a solid brick wall. My next step might be to find all Salsbury/Salisbury in the 1810 census in NY, then eliminate those also in 1820. That could be a career. Kay I love comfort food! We like spicy foods and one of the veggie soups I make I use Rotelle (one or two cans depending on how big a pot I am making) as the base with water at about 1 can to every 4 cups of water. You can adjust to make it spicier or less spicy by altering that ratio. Then I drop in all the different veggies I have hanging around in my freezer or refrigerator where I have half bags or just a few things left. You can also add rice or shell pasta and beans (Doug has some great ideas on that) and if you want to add meat chicken or shrimp or ham works well besides beef. Another quick comfort food is Pasta with tomato sauce and artichoke hearts and garlic bread. Fast, easy and yummy! We make "dead vegetable soup." Actually, it is actually a stock. We keep the peels and scraps after making other meals and put them is gallon ziplocks in the freezer until we have enough to make stock. We have a number of comfort foods but one added in the past year is beans with a hard cider sauce. Cold and dreary makes everyone want comfort food. Ah, soup is such great stuff! Of course as the daughter of a butcher, I was raised eating quite a bit of meat, but now often use it as another flavoring. One thing my mother used to can was "Soup Mix" - which basically was canned tomatoes modified to include onion and celery. It is interesting to see regional variations. My mother-in-law, from the south, would throw in any vegetable available. My mother, on the other hand, more of a Yankee purist, would add nothing other than potatoes and carrots to beef soup. The latest profiles: a scientist/inventor and a history professor. The history professor https://www.wikitree.com/wiki/Dunbar-3636 published a compilation of the pamphlets in the Paxton Boys case of 1763, involving attacks on the Susquehannock tribe in Lancaster County, PA. I had not heard of this incident until I was trying to find out what the Paxton/Paxtang Papers involved. After getting rained on during the cemetery tour last Saturday, I suffered more from the cold germs that traveled into my lungs and at present I am trying to talk as little as possible since my voice gives out and I start coughing. Dale, I had kidney stones about 15 years ago and I can't imagine what a half-inch one would feel like. Most of them I was able to pass but I did have the lithotripsy procedure that you described. Since then I have changed my diet and have had no more incidents. Today is my twenty-eighth wedding anniversary. My husband and daughter are working today. After getting my daughter to her new job at the movie theater, I may have time tonight for an early celebration with him. Vivid memories of the wedding day will soon come flooding back. So long ago and over 1000 miles away, down in Los Angeles. A ring that went missing during the ceremony, lack of planning (I coordinated the reception all by myself--no wedding planner--and left out a few things). I am so glad that my father was there. Now 28 years and two beautiful children later, living in a house that is all ours. We count our blessings. One of my favorite scenes in Braveheart involves defenestration. Happy Anniversary, Margaret! We celebrated our 28th this past July. I remember that scene! Nothing to break the fall but rock. And a couple of surprised soldiers lucky not to have stood in the wrong place! Zactly! And then the wimpy son tries to knife his dad the king. You can also Google search, click on Images, click on Tools on the right, and then select Usage Rights - labeled for reuse. I find a lot of specialty pictures that way. I am back from my class. We had scheduled both Technician and General classes for today and next week. No one showed up except for the instructors. One of the instructors did not have his Extra yet so we decided since we have the building we would give the class for the Extra for him. It was a challenge because none of us had the books for that class and we did not prepare for that class. We did have the Power Point presentation for all three license levels and were able to do the class for this one man. Next week we will be better prepared but it is going to be an all day class because we have to cover more material than the other two classes combined. I also will have to brush up on the material so that I am better prepared for next week as well. I guess that means WikiTree will be taking a back seat in my life for another week. Now if I can just remember what I did with that book I had last May. I really don't want to buy that again. Seriously we have a couple of doctor visits to schedule for Diane's post op care and my granddaughter scheduled her drivers test for Tuesday so I guess the dead relatives will have to wait at least one more week. Some one here once said; "they are dead, they will still be dead tomorrow." (no disrespect intended) So they will still be waiting for you next week Dale. Hope you find your book and all goes well with post op care and drivers test. Plus several more titles—many found only on Fold3. *Access to the records in the featured collections will be free until Nov 15, 2018 at 11:59 p.m. MT. Free access requires registration for a free Fold3 account. After the free access period ends, you will only be able to view the records in the featured collections using a paid Fold3 membership. Thank you for sharing that resource Laura! Ok, I couldn't prevent Gaile to panic, but at least I could help her a little bit with the correct administrative classification of her ggranddad's birth place. I love google books just for all those old scanned books, but also archive.org is a really great resource for that old stuff. Oh and yes, again a Canadian profile got a source (and my watchlist three new Canadian profiles).... I'm missing a feature on the watchlist: Something where we can divide "family profiles" from profiles we adopted or created, but are not related to. I think I need to ask the Tech guys here if that is possible to make. That would be cool. Someone put that in the suggestion box. The lesson learned from this past week's homework is to be extra careful in tracking land records (check neighbors from the census) and tax lists. Didn't go back far enough in the tax lists. Next week is a DNA exercise. Tonight is beet canning (mostly pickled). Tonight I'll spend some time working on some WWI soldiers since this month will mark the 100th anniversary of the end of WWI. Should be fun. This one sounds more doable to me. Can't share details since the family involved has restricted things as well as the class generally not wanting that. At least this time we can work with a partner so my wife and I can collaborate. The reason for not collaborating is that this is supposed to be preparatory for going for certification at BCG (Board for Certification of Genealogists). Haven't decided if I want that much stress but the classes sure make me a better genealogist. 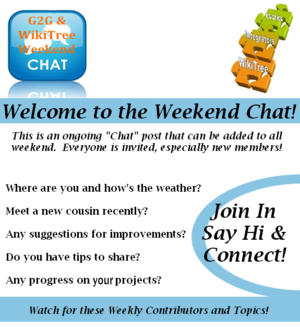 Thanks for hosting the weekend chat Laura and happy you are feeling better and are allowed to be on the computer a bit more again ! This year sure went fast, and shops all are preparing for Christmas here already, just a few weeks now and it's 2019 already...my hubby has his Birthday so busy weekend here. And the weather eeh, well fall is finally starting to kick in now, we had a long dry summer and just a little rain this week, the temperatures are dropping a bit but it's still not really cold. 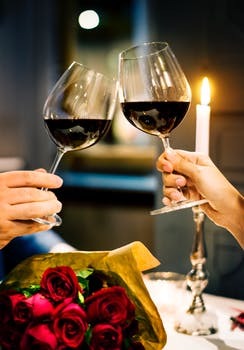 Have a wonderful weekend everyone ! First off Happy Birthday to your Hubby. 2nd how did the new islands just appear..
What a beautiful picture, Bea! This is really fascinating. 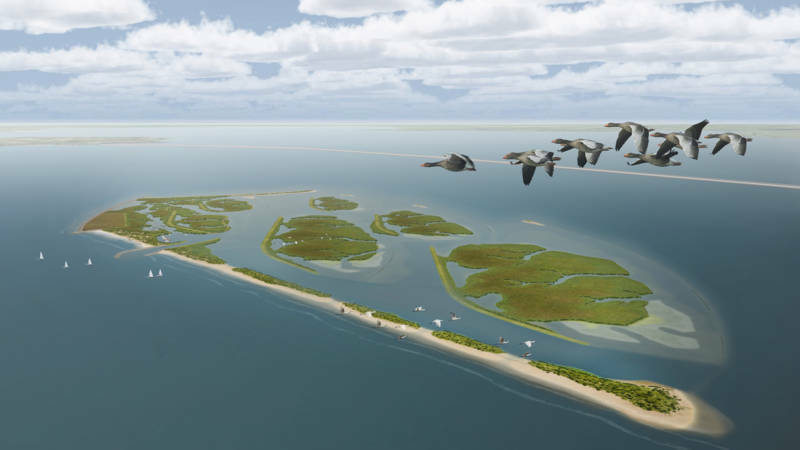 There is a man who came to the US from the Netherlands working with some of our cities to build water blocks to stop flooding from hurricanes and besides building these kind if islands he has advocated building parks and parking garages below sea water that are actually flood plains with fair weather community use. Very cool stuff. Wonderful Picture, Bea! Wishing your husband a Happy Birthday!! Happy birthday to your hubby! I hope your weekend was spectacular. above offering a penny a piece when the supply got low. And she wasn't above accepting!!!! Free money!!! I handed out the candy and I asked each child if they were having fun as they decided among 6 different types the 2 they wanted (I like letting them make decisions it is good training for them and they seem to enjoy it)... anyway one little girl said no because her mother was eating all her candy so I looked out of the door and told Mom come on in and get your own candy! The lady called back, no I am Grandma, Mom is home sick, she ate too much candy! Of course I burst out laughing and let that little girl take one of each! your home for a long time I think. Go back to bed - planning. Everyone is doing just fine at home today so I don't plan on doing much on or off line. I think I deserve a break so I am going to take one and do as little as possible. Good for you Dale! Have a great lazy day! And set your clocks back. Otherwise, sounds like a terrific day! I set the clocks back before we went to bed on Saturday. 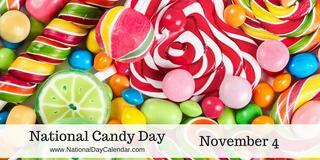 National Candy Day is observed annually on November 4th. Candies come in numerous colors, shapes, sizes and varieties and have a long history in popular culture. It was in the late 13th century that the Middle English word candy began to be used, coming into English from the Old French cucre candi, derived in turn from Persian Qand and Qandi, cane sugar. People use the term candy as a broad category that includes candy bars, chocolates, licorice, sour candies, salty candies, tart candies, hard candies, taffies, gumdrops, marshmallows and much more. Way back in time, before sugar was readily available, candy was made from honey. The honey was used to coat fruits and flowers to preserve them or to create forms of candy. There is still candy that is served in this way today, but it is typically seen as a garnish. Originally a form of medicine, candy calmed the digestive system or cooled a sore throat. At this time, combined with spices and sugar, candy only appeared in the purses and the dishes of the wealthy. It was in the 18th century that the first candy is believed to have come to America from Britain and France. At this time, the simplest form of candy was Rock Candy made from crystallized sugar. However, even the basic form of sugar was considered a luxury and was only attainable by the wealthy. Since 1979, the world has produced more sugar than can be sold, making it very attainable and cheap. When the technological advances and the availability of sugar opened up the market in the 1830s, the candy business underwent a drastic change. Candy was not only for the enjoyment of the well to do but the pleasure of everyone. Penny candies became popular, targeting children. 1847 – Invention of the candy press making it possible to produce multiple shapes and sizes of candy at one time. 1851 – Confectioners began using a revolving steam pan to assist in boiling sugar. M & M’S — M&M’s are milk chocolate drops with a colorful candy coating on the outside. The candies were first manufactured in 1941 and were given to American soldiers serving in the Second World War. M&M’s are produced by Mars Inc. Grab a pack of your favorite candy and enjoy! And Dorothy did all this while recovering from a day long into the next day power outage! So good to have her back! As I sit here listening to bangs, squeals and whooshes, it reminds me of the day my daughter was born. November 4th.....I looked out of the hospital window to see the fireworks exploding over London. 'Remember, remember the fifth of November, gunpowder treason and plot. We see no reason why Gunpowder treason should ever be forgot' http://www.potw.org/archive/potw405.html. In 1605, Guido Fawkes and others tried to blow up Parliament and we've been 'celebrating' the failure ever since. When I was a child it was always celebrated on the fifth. Children would make effigies of Guy Fawkesand ask passers by for 'a penny for the Guy' .The money went towards fireworks Those names, Golden Rain, Mount Vesuvius, Roman Candles are so evocative, not forgetting sparklers to be held in our hands. I wasn't so keen on the bangers and jumping jacks .I remember choosing each individual, and tiny firework from the displays in the local newsagents.I remember my father hammering Catherine wheels into the washing line post and setting off rockets,stuck into glass milk bottles. The effigy of Guy was put on the bonfire to burn, we cooked potatoes in its embers.Sadly the night took its toll in serious injuries from burns so there are now very few private parties on the night and many organised events on the nearest weekend ( so thats what I can hear tonight) For private parties people seem to now follow the US and celebrate Halloween which wasn't an 'event' in my childhood. In Lewes , Sussex, the celebrations continue to be on the fifth. Its a very big event and also commemorates protestant martyrs from the town. There is a big parade and it can it be very political and very controversial. If I had been around in 17th century Dorchester England. ( my local town) I would have seen a procession to church with all the pauper children bedecked in new clothing led by their teacher https://www.wikitree.com/wiki/Capen-60 . Her siblings became part the puritan migration to the New World) The Rev White would, no doubt, have given his usual lengthy sermon and I'd have put a good donation in the collection bag.The collections were always very high on this day. Afterwards the church bells of the 3 Dorchester churches plus St Georges at Fordington (all withina couple of hundred yards of each other would ring in celebration .Would I have joined the less respectable members of the community and thankfully retired to sink a few beers in the many alehouses in Fordington? Usefully Fordington is bounded by the Frome, a narrow river. Many a 'wrongdoer' escaped on a plank over the river, pulling up the plank as they disapeared into the meadows. Lots of history there Helen! In your case you are in the same place as centuries of your ancestors I find that fascinating. Probably makes it easier to identify with them. Most of mine where in other countries 200 years ago.